Add a polished, refined look to your baked goods by baking and serving them in Tulip Style Baking Cups. You and your customers will love the sophisticated touch they add to your display case. Muffins and cupcakes stay fresher for longer when baked in these baking cups. They are made from the highest quality grease-proof paper, which helps to retain moisture and freshness, and promotes even baking. They can withstand heat up to 425 degrees Fahrenheit. Find the right size for your needs! 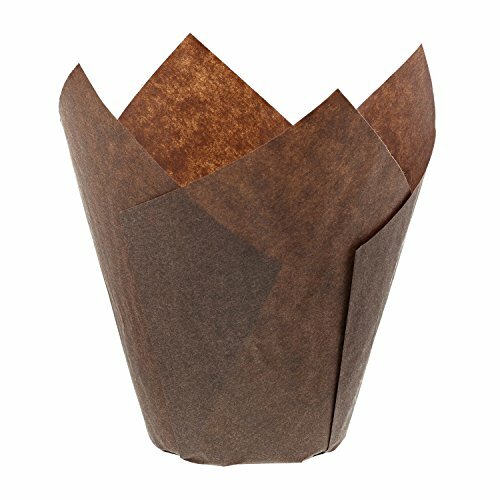 Brown Tulip Style Baking Cups are available in small, medium, and large. The use of baking cups eliminates the need to scrub baked on residue from baking pans. They also eliminate the need to grease baking pans, cutting down on time and calories! OVEN SAFE, AND PROMOTES EVEN BAKING! These tulip baking cups are made from premium quality grease-proof paper. This material helps to retain moisture and promotes even baking. This product is oven safe, and can withstand temperatures up to 425 degrees Fahrenheit. STYLISH, UNIQUE DESIGN! These baking cups are sure to impress customers or guests. They add a refined style to any display case or plate, making your treats look even more divine! Cupcakes and muffins wrapped in baking cups offer a more professional, polished look than non-wrapped baked goods. MAKES BIG MUFFINS! These baking cups can hold about 4 oz of cupcake or muffin batter; an excellent size for big muffins or cupcakes! This style of baking cup is available in small, medium, and large sizes. Perfect for bakeries, grocery stores, cake shops, coffee shops, and more! MEASUREMENTS AND SIZING: Bottom diameter is 2". Height from the bottom of the cup to the bottom of the "V" is 2-3/4". The height from the bottom of the cup to the very top is 3-7/8". They fit in a standard muffin pan. PREVENT MESS, REDUCE THE TIME IT TAKES TO CLEAN! Using baking cups to line muffin pans eliminates the need to scrub baked on residue. This helps save time cleaning, and gives you more time to bake!